Dog sneezing and snorting is sometimes dismissed by owners as one of their pet’s quirks or as common for their breed, but these behaviors can be symptoms of more serious problems, quite frequently allergies. For most canines, dog sneezing and snorting is related to seasonal allergy problems much like humans. The most common culprits are those seeds and grasses floating around in the air in spring and summer. If you notice your pet’s sneezing being worse during those periods of the year, you are probably dealing with dog allergies symptoms. The most common treatment for these allergies is using over-the-counter human medication known as Benadryl. The appropriate dog allergies Benadryl dosage is one milligram for every pound of your dog’s weight. You can discuss the proper dosage with your vet as well. 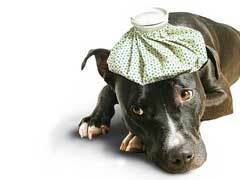 Food allergies in dogs can also occur but the symptoms of these conditions do not include sneezing or snorting. Instead, you’ll notice itching, patches of hair loss, and digestive complaints. While dog sneezing and snorting is most commonly associated with seasonal allergies, other causes can also produce these behaviors. For example, if you notice your dog’s sneeze producing anything other than clear mucus you should see your vet. A dog sneezing blood may suffer from chronic rhinitis, a condition often caused by bacteria, fungi, or even mite infestations. Medication geared towards the specific cause of the condition must be given to clear up the problem. Some dogs are also prone to a condition known as paroxysmal respiration or reverse sneezing. Vets are not sure what causes this to happen but do know it is most common in the smaller dog breeds and in dog breeds with shorter snouts. The condition isn’t serious and is often treated with antihistamines. However, you need to see your vet to rule out any other respiratory problems. If your dog sneezing and snorting seems to be a problem, contact your vet to determine whether the cause is allergies or something that needs a different line of treatment.